We’ve all heard about the fastest growing form of charitable giving: Donor Advised Funds (DAFs). If you are a fundraising professional chances are you can’t open up your inbox or the latest philanthropy magazine without reading about how DAFs have surpassed $110 billion in assets in 2017, or how 6 of the top 10 largest charities in the United States are actually sponsors of DAFs, or tips and tricks for accessing “grants” from the elusive DAF accounts. If you’re a grantwriter like me, you probably got really excited to learn that $19 billion were paid out of DAFs in 2017. You maybe even opened a Dove dark chocolate hoping for an inspirational message promising “a DAF grant is coming your way” in the next year. I have bad (and maybe good) news for you: DAFs aren’t really for grantwriters…but could be. Before we dive in, let’s start with some background. How DAFs work: A donor establishes a DAF with a deposit held at either a national sponsor like Fidelity Charitable (over 50 percent of all DAF assets are held in this type of sponsor) or a community foundation (30 percent of all DAF assets are held in this type of sponsor). (There’s also a third type of sponsor of DAFs called a single-issue charity that uses DAFs to advance work in a single topic such as the Nature Conservancy or Jewish Federation, but their use of DAFs is different enough from the focus of this article that we’ll simply tip our hat to them here and move on). One reason why DAFs are so quickly increasing in popularity is that a donor gets an immediate tax deduction the moment the account is opened and irrevocable contributions are made into the fund – fast, efficient, simple, and effective. The money legally belongs to the sponsor but the donor can continue to “advise” the sponsor on when and where payouts are made from the account. Grants are paid from the fund by the sponsor to recognized charitable organizations. For a more comprehensive overview on the current DAF landscape, check out the National Philanthropic Trust’s 2018 DAF report. Why now? While DAFs are a relatively old charitable giving vehicle (they’ve been around since the 1930s), in recent years they’ve become a focus of attention due to their quick rise in engagement from financial planners and donors and therefore growth both in terms of dollars held in assets and relative percentage of all charitable giving. DAFs are increasingly popular among donors because they’re less administratively cumbersome to set up and administer (compared to private foundations), provide an immediate tax deduction, can handle donations of complex assets (such as appreciated stock or real estate), and streamline charitable giving through a simple fund. The National Philanthropic Trust offers additional comparisons of DAFs and private foundations for prospective donors. Despite hearing terms like “grants” and “foundations” attributed to DAFs, there are several reasons why a grantwriter should temper their optimism for DAFs as a strategy to reach their grants goal. 1. Private, corporate, and community foundations are regulated by the IRS, required to disclose key information about their funding purpose, trustees and staff, income and expenses, financial health, and grant recipients and amount. In the case of private foundations, the IRS mandates they spend at least 5 percent of their assets each year. Because of the IRS regulation of foundations, grantwriters (and the general public) have access to important information that leads to time savings in fundraising, better public accountability, etc. 2. Currently, DAFs are not subject to any payout requirement and DAF sponsors are not required to report any account-specific information such as who holds DAFs, how much money is held in a particular DAF, where payouts go (and what amount). Sponsors are only required to report aggregate information (such as the total number of DAFs they sponsor, the total amount of assets held across all sponsored DAFs, etc.). It’s important for grantwriters to know this so they don’t spend precious time and energy looking for information that’s likely not available to the public. 4. How much of a community foundation’s assets is actually available through an open application process? The size of total assets held at a community foundation isn’t necessarily an indicator of how much they might be giving out in community grants that year. Often a significant percentage of assets are held in DAFs or other restricted forms. It’s important for grantwriters to know this so they rightsize expectations to the dollars that are actually available through an open application process. How can I learn how much of a community foundation’s assets are in DAFs? 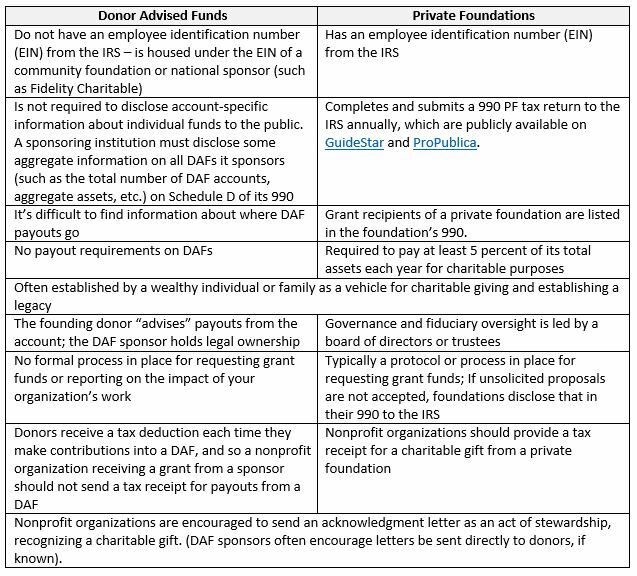 If a community foundation sponsors DAFs, they are required to complete Schedule D of Form 990, where they report the number of DAF accounts held, aggregate value of contributions to DAFs during the year, aggregate value of grants paid during the year, and aggregate value of assets at the end of a year. They also report that same information for “funds and other accounts.” In the example below, you can see how DAFs fit into the broader picture of the community foundation’s total assets and grants. While charitable dollars are technically “granted” out from a DAF, that payout has little in common with the traditional “grant” that many of our organizations pursue from private, corporate, and community foundations. While traditional foundation grantmaking is usually pursued by people (either staff and/or board) looking at published funding priorities, application processes, and decision-making timelines, DAF payouts (similar to individual giving) are typically “advised” (decided) by one or two individual donors at their own discretion. In the past few months a few resources have come out offering practical advice on how nonprofit fundraisers can better access charitable dollars from DAFs (see also: eBook from the National Philanthropic Trust and DonorPerfect, a toolkit developed by The Chronicle of Philanthropy, an article by Claire Axelrad, J.D., CFRE “Strategies to Leverage Donor Advised Philanthropy,” etc.). Much of the “practical” advice out there is geared toward nonprofits with existing donors. These tips can be helpful for grantseekers when some of our current or prospects funders are individuals with both a private foundation and DAF. It’s worth exploring (you can use NOZA Search to look up named funds at community foundations and commercial sponsors). But for the most part DAF fundraising behaves more like individual giving than traditional grantseeking – it’s about working with identified individual donors to inspire charitable giving as opposed to navigating formal application processes to request funding. While it’s important to understand the underlying functions and purposes of DAFs, grantwriters should never abandon hope (or stop eating Dove dark chocolates for inspirational messages). Fundraising strategist Dana Holt frames it this way: “Imagine you learned from your colleague in individual giving that one of your donors has a family foundation. How would you feel? Probably pretty excited. DAFs are also dollars irrevocably reserved for public good. The donors who established the fund are committed and strategic about their giving.” Grantseekers can access charitable dollars from DAFs. The strategy to do so, however, is different from the traditional grantseeking processes, and understanding the core differences between DAFs and foundations is a crucial first step. About the Author: Kari Aanestad is codirector of GrantAdvisor.org and the director of advancement at the Minnesota Council of Nonprofits (MCN). In this role, Kari advances the mission and work of MCN and Minnesota’s nonprofit sector through strategic visioning, fundraising, relationship development, sector research, and education. She is also the Vice President of the Minnesota-Northstar Chapter of the Grant Professionals of America. Credits & Acknowledgments: Kari Aanestad and Dana Holt are participating members of a Donor Advised Fund Working Group convened by the Minnesota Council of Nonprofits. The working group is comprised of nearly 50 individuals representing nonprofit fundraisers, wealth advisors, community foundations, and independent consultants working together for a broader goal of increased public education about Donor Advised Funds. Content from this post is informed in part by conversations among that group (but not reflective of the group’s opinions or perspectives). Special “thank you” to Dana Holt for content verification and editorial input! Nice article with sufficient detail.